I’d been wanting to see the Grand Budapest Hotel for a long time but never actually got round to watching it until a few weeks ago on Netflix. This Grand Budapest Hotel is a light hearted, stylish and and very well written. Being a Graphic Designer, I found the style of this film to be very appealing. The use of typography in this film is stunning especially on the Mendl’s Boxes. You can buy our Mendl poster here which was inspired by the film. 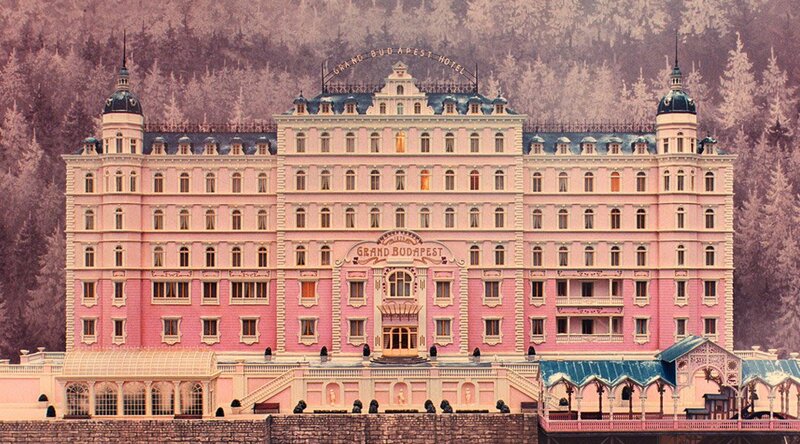 The Grand Budapest Hotel retells the adventures of Gustave H, a concierge at a famous European hotel between the wars, and the story of Zero Moustafa, the lobby boy who becomes his most trusted close friend. The story involves the theft and recovery of a priceless Renaissance painting and the battle to get their hands on an enormous family fortune. I would say that this is one of Wes Anderson’s best movies. It has all of Anderson’s creative impulses working in one direction, producing a stunning work of art. His films have always been unique and out-of-this world. You find yourself being submerged in to a different world. Everything works well together, the colours and the way the camera moves. The music, the distortion of the lens and not to mention the stellar cast. The CGI in this film is very high quality and it is used perfectly to add to the surrealism of the movie. This is an extremely well crafted film, not only visually, but also by the way it’s structured. Unlike some of his Wes Anderson’s previous work, the editing and pacing of The Grand Budapest Hotel are perfect! My favourite scene in The Grand Budapest Hotel is when it shows all the concierges in hotels all over Europe, calling each other to help Gustave H. Each of them is then shown in his hotel, busy doing some important job like tasting the soup or giving first aid to an unconscious hotel guest, when he is being called away to the telephone. Each hands the job over to his assistant. This fast succession of little scenes is done really well and it’s great to watch. You can’t go wrong with The Grand Budapest Hotel. It’s probably one of Wes Anderson’s best films, it has gorgeous visuals, excellent acting and a great story. If you’re a fan of Wes Anderson’s previous work, you need to watch this now!